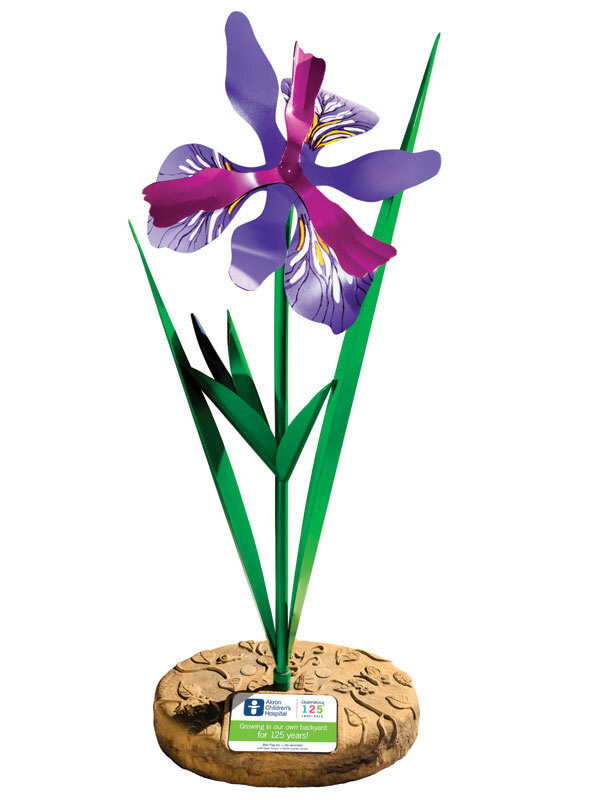 You’ll find the Blue Flag Iris sculpture at Canal Park in downtown Akron. 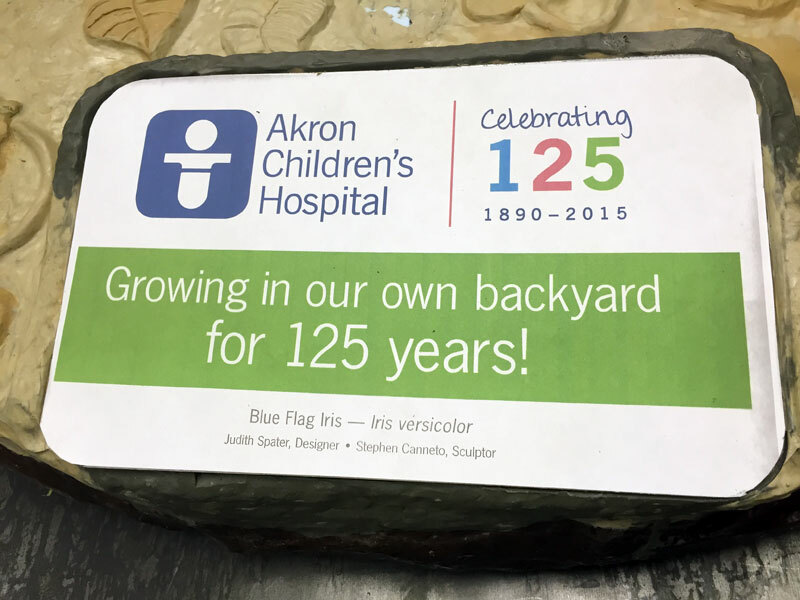 Art has long played an important role in what we do and who we are at Akron Children’s Hospital, especially art that depicts life through the eyes of a child. So what better way to commemorate our 125th anniversary than with a community art program of brightly colored, larger-than-life metal flower sculptures? The hospital commissioned 25 stunning works of art to celebrate the community spirit and support that’s been growing in our backyard since our humble beginnings in 1890. The vibrant art serves as a metaphor for our growing, thriving and blossoming pediatric healthcare system. 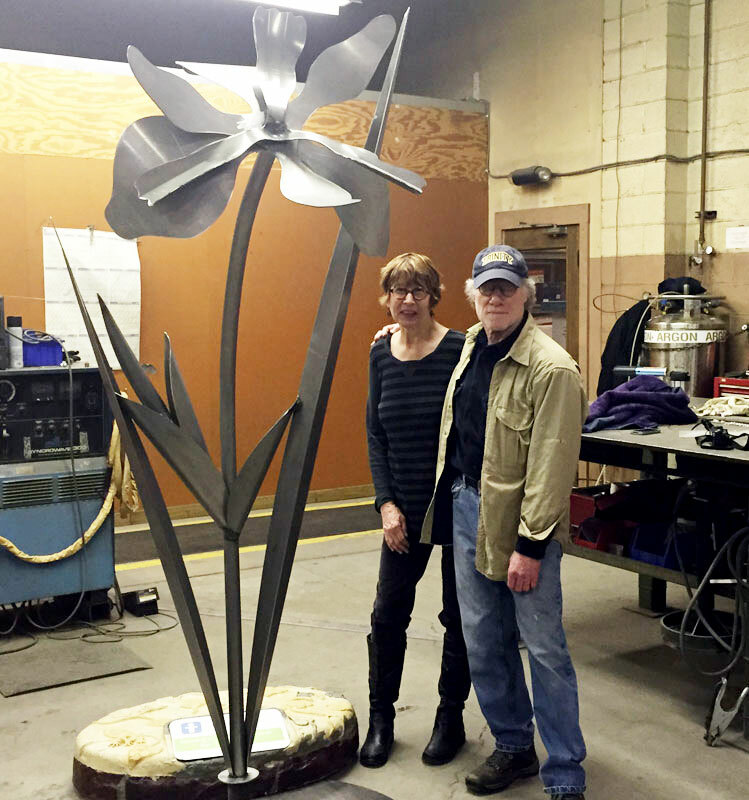 Judith Spater and Stephen Canneto stand next to the Blue Flag Iris in the shop where the sculptures were constructed. The 6- to 9-foot eye-popping sculptures, designed by Judith Spater and created by Stephen Canneto of Columbus, represent more than 15 different real-life flower species native to northeast Ohio, including violets, sunflowers, lilies, coneflowers and asters. Crafted out of metal and stainless steel, the sculptures are durable enough to withstand the region’s climate extremes. The sculptures will be popping up at spots around the greater Akron region where families already love to visit. We’ve partnered with organizations, venues and businesses to display the colorful creations in many of the communities we’ve been privileged to serve. 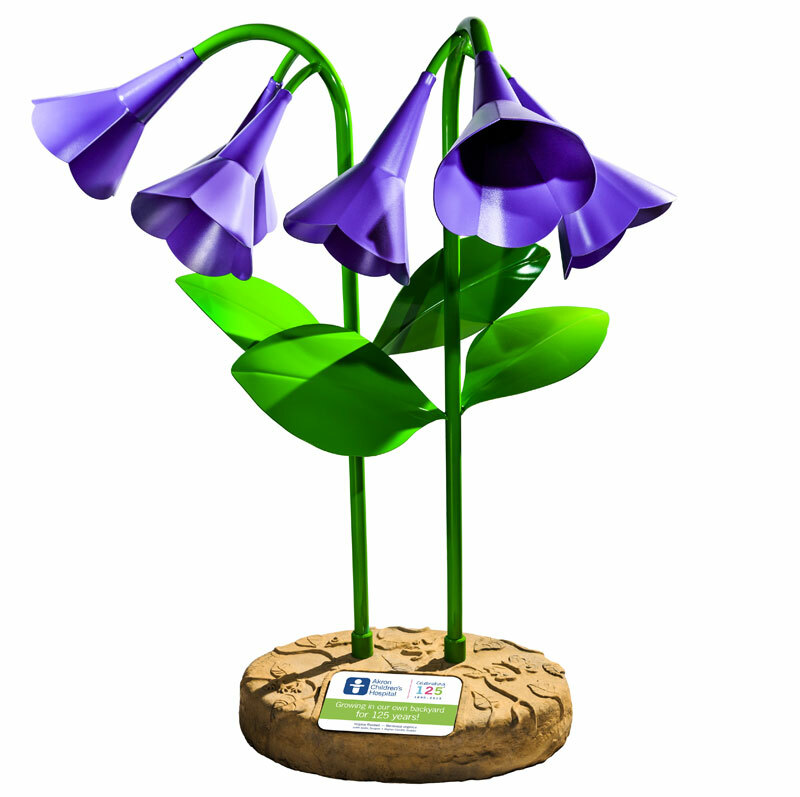 You’ll find the Virginia Bluebell sculpture at Lock 3 in downtown Akron. The spring timing for the first peek at the flower sculptures is also aligned with the much-anticipated grand opening of our Kay Jewelers Pavilion. The giant flowers are a natural fit for the fun and child-friendly backyard theme of our new building, which houses a new ER, NICU, outpatient surgery center and special delivery area. We look forward to displaying an 8-foot, bright yellow Trout Lily in the garden area in front of our hospital. Each sculpture will include this commemorative plaque.